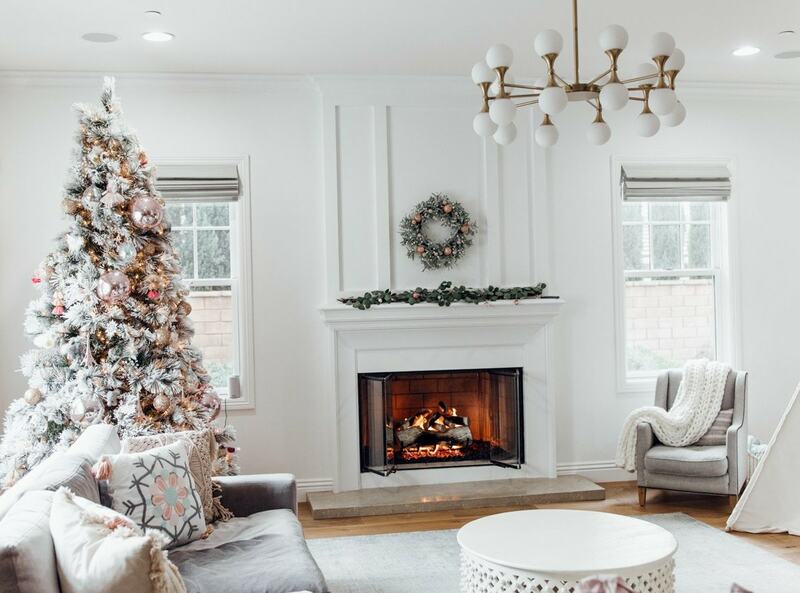 My secrets for how to decorate a dreamy Christmas tree! 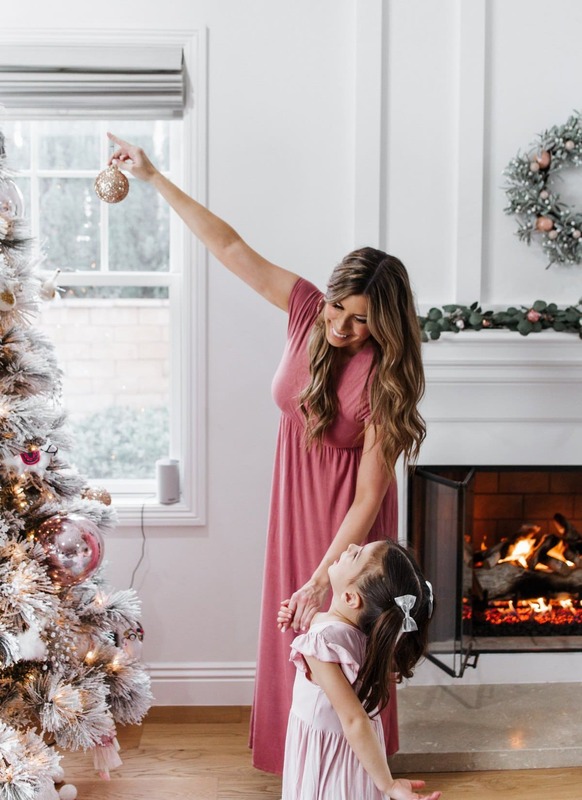 There is NOTHING that brings that Christmas magic into your house like an evening spent decorating the tree as a family! Everyone is excited and giggly and it's so, so fun to see our home with a twinkling tree added into the mix. I know these are evenings I'll remember forever and I hope my girls do, too! 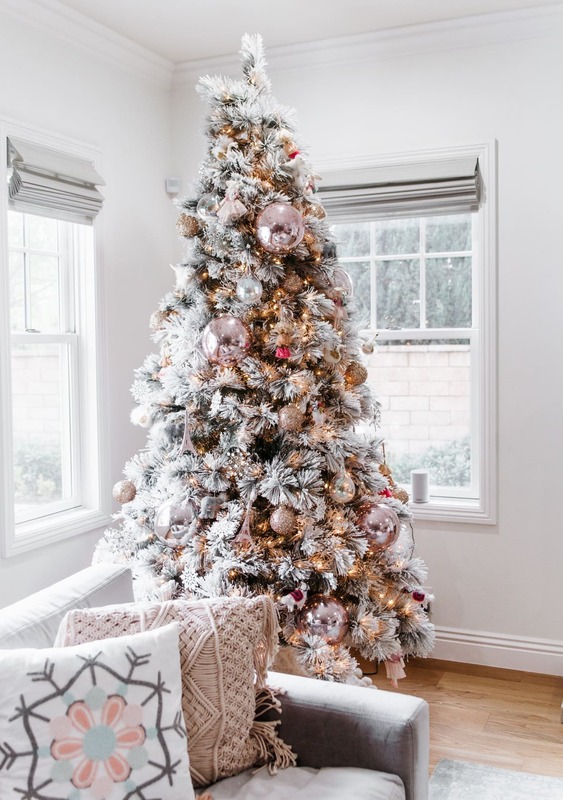 I have a few tips for decorating trees that I've picked up over the last few Christmases that have been GAME CHANGERS, so today I'm sharing the know-how with you so your tree can look exactly like you want it to! I was able to find the most full, gorgeous flocked tree at an awesome discount through QVC. It has the perfect amount of twinkly lights and it sets up in a snap. Easy breezy! Honestly, this tree is so beautiful you could leave it bare and it would look gorgeous, it's just that good. Of course, we got it totally decorated for the season, but it really is so full and beautiful on it's own! Just a quick note about what we're wearing – my maxi dress is actually a maternity dress I wore while pregnant with Millie but it's so comfy and nursing friendly and it doesn't look maternity that I've just continued to wear it! My girls have been LOVING these maxi dresses for play or sleep or church or anytime really. 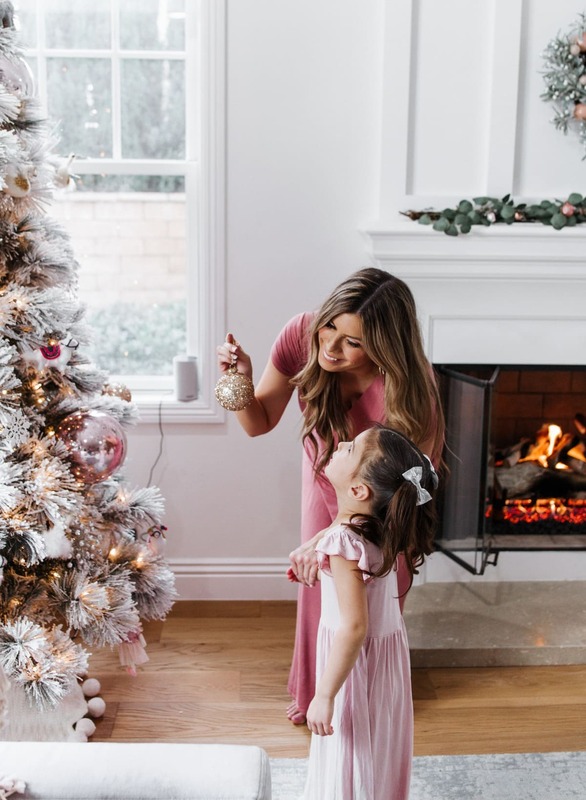 I wanted all rose gold on our tree this year, and I was able to find a really soft and pretty mix of ornaments from Lauren Conrad's line at Kohl's (that you can get 25% off today with code HOLIDAY25 at checkout!!). Everything was glittery and shiny, so Ani and Lyla were obsessed, and of course they also loved these whimsical little animals! I tried to find a mix of both shapes and textures to give our tree depth and variety while sticking to the color theme I had in mind. Tip 2: Of course, you'll want to evenly disperse the big vs. small ornaments. Start with the biggest and place them evenly around the tree, and then go to medium, and then small. I always get everything placed where I think I want it, take a few steps back to look for gaps, and go back in to even everything up. 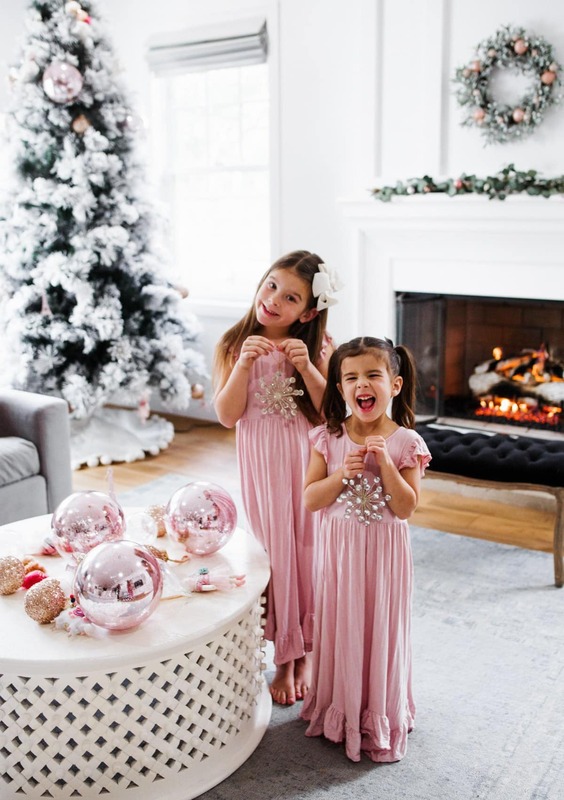 I was SUPER happy to find these big rose gold balls for our tree. They make such an impact when you step back and look at the whole tree. 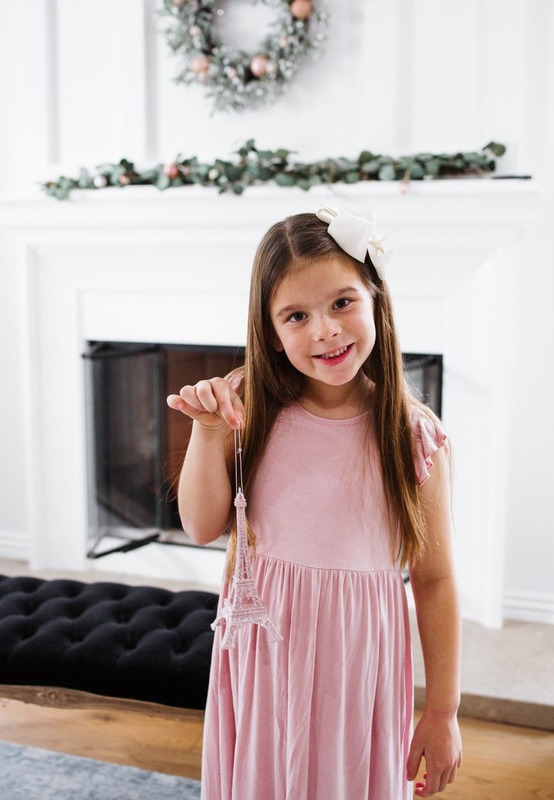 Tip 3: When you're decorating the tree as a family, you're going to end up with a TON of ornaments at your kiddo's eye level…and usually a bunch of the same ones in clusters, too! I don't stress about it at all while we're working on the tree as a family. I just admire and let the girls know what a fabulous job they're doing! Then once they're in bed, I get everything evened up throughout the tree. This helps my ornament OCD and lets the girls still feel like they were totally part of the tree-decking action! Let's just make a side-note of this adorable pompom tree skirt! Have you ever seen anything cuter? I love the playful base it gives our tree. Love at first sight! FINALLY…our finished product! I'm so in love with how the tree turned out this year. We do need a star or some sort of tree topper … do you have any suggestions for me?! Something rose gold preferably! I hope these tips help you achieve the tree of your Christmas dreams! This is my very favorite time of the year, and there's really nothing I love more than the cozy warmth of a flocked tree with little twinkly lights in my house. It's such a magical feeling when you add in the holiday music! 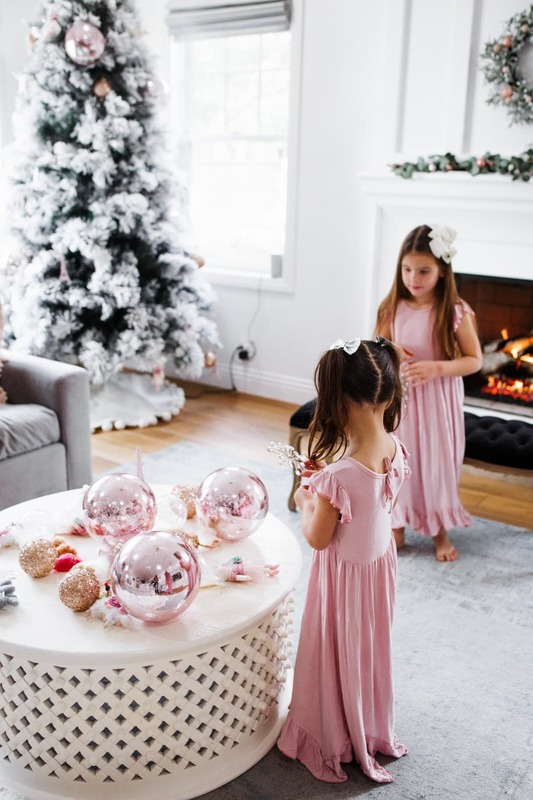 There is NOTHING that brings that Christmas magic into your house like an evening spent decorating the tree as a family! Everyone is excited and giggly and it’s so, so fun to see our home with a twinkling tree added into the mix. Corrine your holiday decor is gorgeous. I’m loving the oversized bulbs and burlap tree skirt. 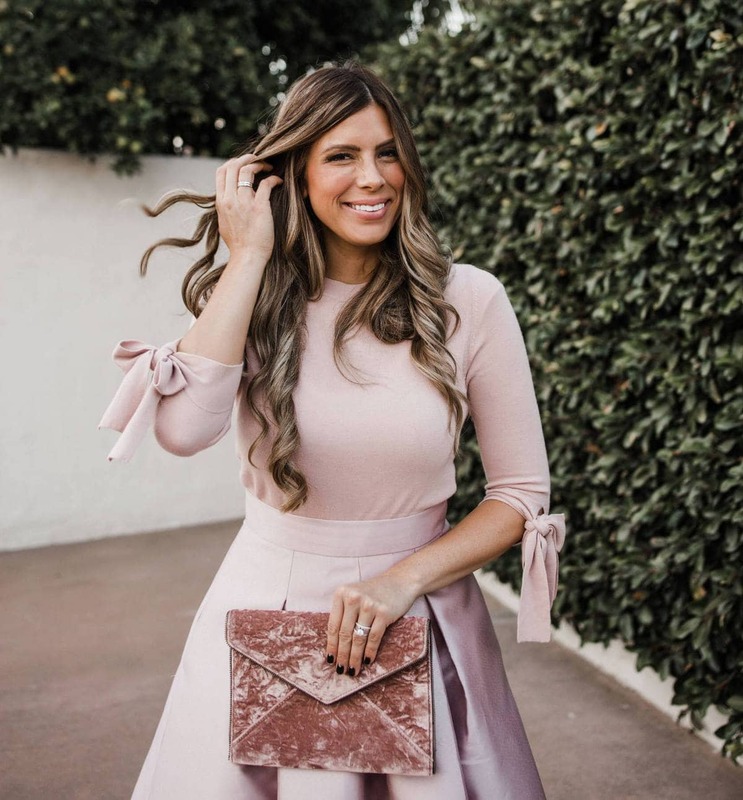 Moments ago I placed an order with tpt online for some of those adorable ruffle stockings and I cannot wait for them to arrive! Cheers! oh thanks so much emily! Wow, that is an amazing tree! I live pretty close to the one in sandy, I need to check it out! 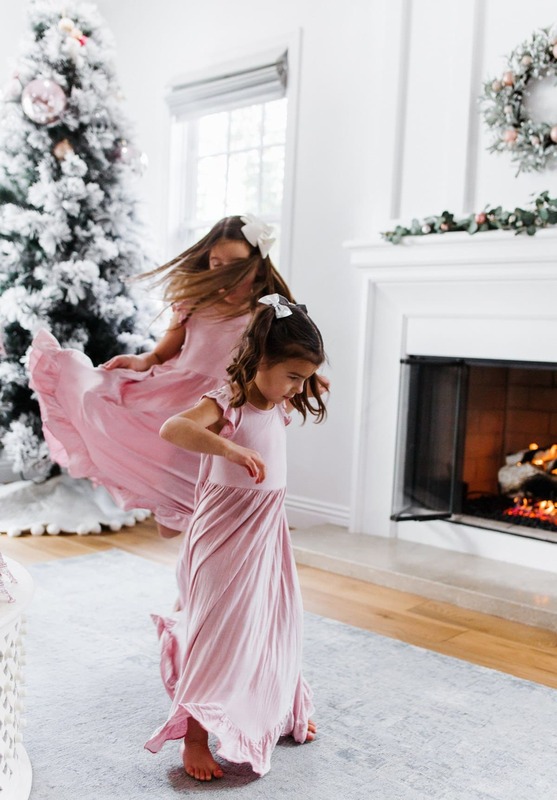 HOT SALE on the CUTEST matching Christmas pajamas you’ll be obsessed with!